Welcome to Birmingham Airport Arrivals the unofficial and definitive guide to the UK’s 7th busiest airport that is situated 7 miles South East of the city of Birmingham. This airport guide as the name suggests; brings you live information on flights arriving and departing from Birmingham Airport to destinations around the UK, Europe and beyond. At this site you will find all of the information you need when travelling through this major transport hub in the West Midlands. Birmingham Airport Arrivals is part of a group of websites that focus on providing up to date flight information for the UK’s busiest airports. Created and managed by aviation enthusiasts our aim is to supply the user up to date flight status highlighting any delays and possible problems. This Birmingham airport guide can be used as a handy reference for those waiting for a flight arrivals or departures. The live flight boards will let you know if there are any delays or if the flight is on time. This unofficial guide also contains information regarding the facilities available at Birmingham Airport as well as facts figures and information on parking and where to stay. The airport has a wide range of facilities for the travelers whether you are a business man wanting business facilities, a family or a sole traveler wanting some first class luxury. The airport consists of two terminals and offered thousands of direct flights to destinations in the UK, Europe and beyond. 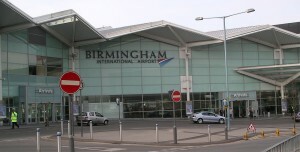 Over 40 airlines use Birmingham Airport ranging from domestic flights from carriers such as FlyBe, budget airlines such as Easyjet and Ryan Air to large national carriers such as Air France and Emirates. As this is an unofficial guide we can not be held responsible for any wrong information provided on this site. All of the live flight information is provided via a third-party. If you are unsure or would like to know more we suggest that you contact either the airline you are using or the official airport website direct. Birmingham is the latest UK airport to announce daily flights to Doha with Qatar Airlines. The airline will fly the state of the art Boeing 787 Dreamliner, linking up the UK’s second city with the Middle East and the rest of the world.